We know you want the best for your child. Choosing Sylvan is about getting results and setting your child up for long-term success. At Sylvan, we’re focused on building academic confidence, igniting intellectual curiosity and inspiring a love for learning — all of which make a big impact in school and in life. For 40 years, we’ve helped millions of students and families like yours achieve new levels of academic success. Our secret sauce? The best teachers and technology! At Sylvan, you get the best in certified teachers and interactive technology, so your child feels fully engaged and gets the exact learning he or she needs. Our teachers not only instruct, but they challenge and inspire your child. And did you know? 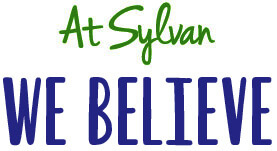 Sylvan is the largest, private employer of certified K-12 teachers in the world! We developed our proprietary Sylvan Method™ through academic research, years of teaching experience and technology. Whether your child has fallen behind or is way ahead of the class, Sylvan has a program to challenge your student, build confidence, boost study skills and help deliver better grades. Based on independent research, our students see up to two to three times more academic growth than other students. We’re so confident that our Personalized Tutoring programs work that we guarantee your child’s progress! A child’s future depends on a solid education and a love of learning. We teach your child how to learn, so he or she builds the confidence and skills to be successful in school and beyond. No two students are exactly alike. That’s why we offer diverse programs and a personal approach to make sure your child is learning in a way that works best for him or her — at the right pace, in the right style, with the right skills. Our teachers don’t just teach. They get to know your child, providing the positive reinforcement that leads to success. Our educators turn frustration into confidence, Bs into As, and dreamers into life-long achievers. Technology is changing the world, enhancing the way we live and learn. But technology doesn’t teach students, teachers do. We blend great teaching with great technology to get the best out of your child. We’re committed to ensuring that every Sylvan student advances in our programs. We have over 35 years of great results, millions of successful students and counting. Find out what our next generation programs, cool technology and personal approach can do for your family.